Why do Kids get Angry? 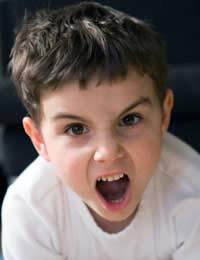 Home > Kids and Anger > Why do Kids get Angry? Like adults children get angry for a number of reasons, the biggest difference is that kids tend to have less control over their emotions and deal with their anger in a different way. Most children get easily frustrated and have some form of outburst following which it has been dealt with and is therefore forgotten. Adults however, tend to hold onto their anger and let it build up until something triggers an outburst which can be more aggressive and intimidating than a child’s. Despite this there are some circumstances in which a child will store their emotions and give anger a chance to grow and escalate and this is frequently seen in those who have had particularly traumatic childhoods during which they are exposed to situations that they cannot process or cope with emotionally. Hormones play a large part in how children experience anger. Those approaching puberty may find that their tolerance levels are lower than normal and that they are increasingly angry especially with those around them. They can feel restricted and a lack of understanding to their changing and heightened feelings and emotions. They may not want to communicate and they shouldn’t be pushed as this can trigger a worse reaction.Puberty does not last forever and during this time the child should be given space and privacy which shows them that their feelings and wishes are respected and their parents/carers understand the changes they are experiencing. Most young children will experience occasions when they get very frustrated by their lack of ability to communicate effectively. This skill develops over time in most people, but for children it can be very annoying if their parents, carers or peers do not understand what it is they are trying to say.If you have a toddler or young child who gets easily annoyed and angry at not being understood it is essential that you give them enough time to say what they are trying to. Do not be tempted to finish sentences or answer questions for them. They need to do this themselves in order to develop the skills needed, to feel respected and appreciated and also to develop confidence and self-worth. Young children can become angry very easily and very often. This is totally normal and something that most parents simply have to learn how to deal with. Toddlers and young kids may experience frequent anger as they are learning the world around them and where they fit in. It may also be a way of finding out where their boundaries are and the role of their parents. They are learning what is in and excluded from their control, but it also should be noted that children do not understand what patience is and cannot understand why they must wait for things sometimes. Children may learn that anger is acceptable from their parents. If parents are frequently shouting, showing negative feelings towards each other or displaying hostility, the child will believe this behaviour is ok and that by showing anger, things get done and they will get their own way. Children can become angry for a number of reasons and as parents we must learn how to deal with this. Often this is done best by leading by example, setting rules and guidelines and understanding why the child is getting angry in the first instance and learning how to avoid specific situations when anger is likely. My eight-year-old son has been bullied at school all year, and i have done everything i can think of to help him. but it seems the more i get involved at his school, the more he gets bullied and now the school officials seem to be singling him out as well. he has now developed an anger issue, and i am at a loss in how i can best help him.